Our ever popular Jack the Joker fundraiser continues this Sunday night in Alice O’Connor’s Bar where the jackpot is €5600 as on Sunday night Joe Power was drawn out of the drum and chose card number 9 which when turned was not the joker but he did win €50. The Walsh family and Hiker McGrath won €25 each. As well as our group of ticket sellers tickets can be purchased from Village Flowers, Spar, Mousies Takeaway, Minnies Bar, Abbeyside Post Office and Crotty’s Bar. On Saturday night last we took on Dungarvan in the Western Final in Fraher Field. Like all good local derby games it was a competitive and entertaining game with our opponents 7 points clear at half-time. However the team showed great character to battle back into the game in the second half to secure a draw. The replay goes ahead this Saturday night at 7pm in Fraher Field. TEAM: S. RYAN, C. McCARTHY, J. DUGGAN, M. COLEMAN, M. TWOMEY, C. PRUNTY, J. ELSTED, D. LOOBY, D. McGRATH, N. MONTGOMERY, J. BERESFORD, S. WHELAN BARRETT, E. KIELY, S. DALY, T. LOOBY. SUBS: B. MOORE, K. DWANE. This Sunday Ardmore will take on Ballybacon / Grange in the Munster Junior Hurling Final and we would like to wish them the very best of luck ahead of the game. Our Annual General Meeting will take place in Ballinroad Hall on Saturday December 9th at 8pm. On behalf of all in the club we would like to send our sympathies to Jack O'Hare and all the O'Hare family on the death of Jack's mother Kathleen O'Hare in Milstreet, Co. Cork last week. Kathleen's grandsons have all worn our club colours with distinction and won County honours in both codes. Jack, through his business Adesco, has been a generous and supportive sponsor of the club in recent years, whilst he currently serves on the club committee. Once again we send our sympathies to Jack and his family on their loss. Our club bingo session continues in the CBS Hall this Sunday night with a jackpot of €1150. Our ever popular Jack the Joker fundraiser continues this Sunday night in Alice O’Connor’s Bar where the jackpot is €5400 as on Sunday night Maurice Fennell was drawn out of the drum and chose card number 40 which when turned was not the joker but he did win €50. Christy Dunford and James, Jack and Joey won €25 each. As well as our group of ticket sellers tickets can be purchased from Village Flowers, Spar, Mousies Takeaway, Minnies Bar, Abbeyside Post Office and Crotty’s Bar. On Thursday night last we were defeated by the Nire in the County Championship in Fraher Field. Despite having a number of scoring in both halves it was our opponents who emerged as winners and we wish them the best of luck in the remainder of the year. We would like to thank our players and the management team for all their efforts throughout the year. TEAM: S. ENRIGHT, C. McCARTHY, B. LOOBY, D. COLLINS, J. ELSTED, S. O’HARE, D. McGRATH, J. O’MAHONY, J. HURNEY, C. PRUNTY, S. BRIGGS, P. HURNEY, M. O’HALLORAN, N. MONTGOMERY, M. FERNCOMBE. SUBS: G. HURNEY, S. WHELAN BARRETT, T. LOOBY. This Saturday night we take on Dungarvan in the Western Final at 7pm in Fraher Field. On behalf of all in the club we would to congratulate Gary Hurney and his bride Tammy Hehir, who were married on Friday last. We hope they had a wonderful day and wish them many happy years together. Our club bingo session continues in the CBS Hall this Sunday night with a jackpot of €1050. On Saturday morning last all in our club were left in a state of deep shock as word of the tragic death of Philip Cashin spread throughout our parish. Like all the members of the Cashin family, Philip was deeply involved with the club all of his life and indeed he had played in goal for us in the Western Junior Football Final on Sunday morning last against Kilgobnet. Being a member of a family so synonymous with our club and living so close to our own pitch it was only natural that Philip played with the club from a young age where he quickly established himself as a fine goalkeeper in both hurling and football. Philip’s brothers both played with the club and his father Eddie of course captained the Club to Senior Football County honours, whilst his uncles all wore the club colours with distinction. Philip was deeply proud of this legacy and was keen to continue on this proud family tradition. The team that Philip came up through the ages with had many notable victories, none more so than in 2009 when they won a County Minor Hurling Championship, by defeating Clashmore in the County Final, making up for losing the Minor Football Final earlier in the same year. In 20012 Philip was again in goal for the under 21 Football team who firstly defeated Dungarvan in a thrilling Western Final, before going onto defeat Roanmore in the County Final. 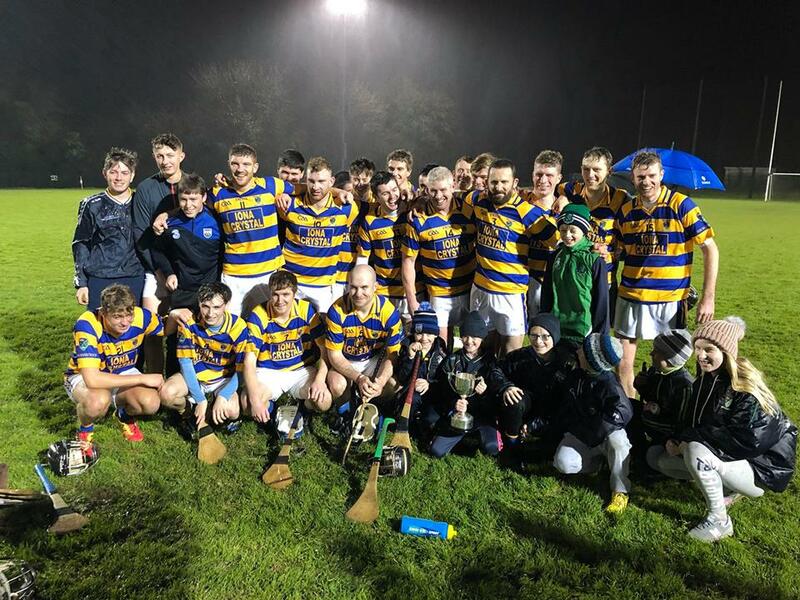 The same year the team continued their progress on the hurling front by qualifying for the Western Final, where they narrowly lost to a strong Lismore team. In 2013 Philip once again lined out in goal for our under 21 football team who staged a dramatic comeback in the Western Final to seal a memorable win against St. Olivers. Throughout all of these successful campaigns Philip was an assured and commanding presence in goal and saved many certain goals, without which the team would not have won as many honours. Philip continued to play for the club after finishing at under 21 level, playing in goal for both codes and was never found wanting in helping the club whenever he was called upon to do so. Whilst all involved in the club are still in shock at Philip’s untimely passing, our sense of loss is insignificant compared to the heartbreak being experienced by his family and circle of close friends. All we can do is offer our help and support to the Cashin family and assure them that the club will be there for them in the dark days that lie ahead for them. Once again we send our sympathies to Philip’s heartbroken parents Eddie and Jacinta, sister Clíodhna, brothers Éamonn and Thomas and all the members of his extended family. Ar dheis Dé go raibh a anam. 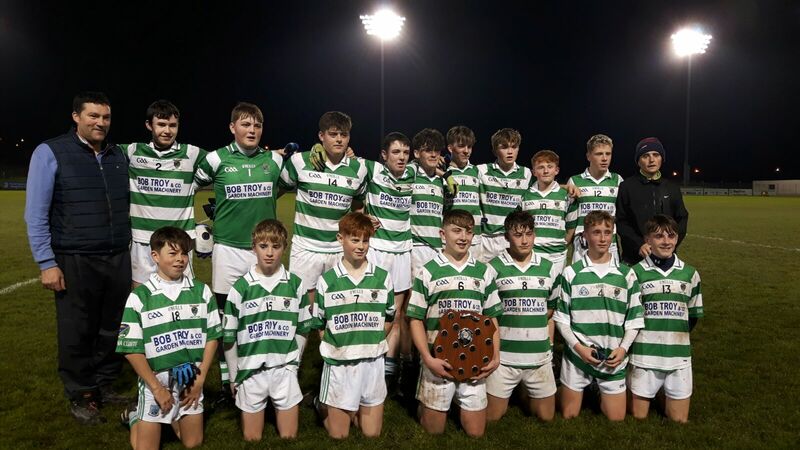 Congratulations to our U15 panel and management on their superb 1-12 to 2-4 victory over Tramore in the County Division 1 Football Final played at Fraher Field this evening. The lads produced a wonderful first half performance to lead by eight points and withstood a strong fightback by their Eastern opponents in the second to deservedly take the title by five points. Our ever popular Jack the Joker fundraiser continues this Sunday night in Alice O’Connor’s Bar where the jackpot is €5200 as on Sunday night Catherine Power was drawn out of the drum and chose card number 5 which when turned was not the joker but she did win €50. Tony and Siobhan and the Cosgrave family won €25 each. As well as our group of ticket sellers tickets can be purchased from Village Flowers, Spar, Mousies Takeaway, Minnies Bar, Abbeyside Post Office and Crotty’s Bar. Our Junior hurlers defeated De La Salle in the County Final on Friday night last in Carrickbeg. Despite the poor weather conditions on the night it turned out to be a very entertaining and competitive game of hurling. Having taken the lead early in the game with some well taken goals we held on to lead right up to the full time whistle to maintain our unbeaten run in the Junior championship in 2017. We would like to thank all the players for their commitment throughout the year and to the management team for all the hard work they put in behind the scenes during the year. It was fitting that the cup was presented to one of our greatest servants Gavin Breen after the game. TEAM: S. RYAN, C. McCARTHY, G. BREEN, M. COLEMAN, S. BRIGGS, P. LYNCH, D. HENLEY, D. SWEENEY, P. COLLINS, E. ENRIGHT, D. HICKEY, M. FIVES, M. MAHER, L. HURNEY, R. RYAN. SUBS: K. DWANE, D. LOOBY, S. O'CONNOR. On Sunday morning last we took on Kilgobnet in the Western Junior Football Final in Leamybrien. After playing against the strong breeze in the first half we only trailed by 2 points at half time but despite a great effort by the team in the second half it was Kilgobnet who emerged victorious and we wish them the best of luck in the County Final. Our club bingo session continues in the CBS Hall this Sunday night with a jackpot of €1000. 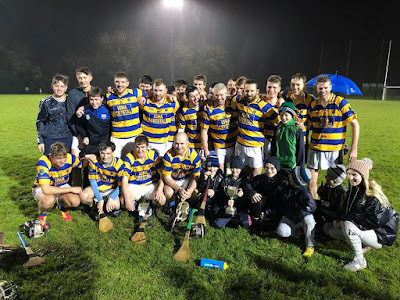 Congratulations to our Junior 'B' hurlers and management team on their 4-9 to 0-13 victory over De La Salle in tonight's County Final played in miserable conditions in Carrickbeg. The lads got off to a wonderful start with three early goals before the Eastern Champions regrouped to cut the deficit to three points by half time. Early De La Salle points in the second half left the minimum between the teams before the boys took charge in the final quarter to run out winners by eight points. Well done to all concerned on a fantastic year. Our ever popular Jack the Joker fundraiser continues this Sunday night in Alice O’Connor’s Bar where the jackpot is €5000 as on Sunday night Tony and Siobhan were drawn out of the drum and chose card number 23 which when turned was not the joker but they did win €50. Patch Foley and Catherine Power won €25 each. As well as our group of ticket sellers tickets can be purchased from Village Flowers, Spar, Mousies Takeaway, Minnies Bar, Abbeyside Post Office and Crotty’s Bar. We have been drawn against the winners of Gaultier / The Nire and Rathgormack in the next round of the championship. On Saturday last we played St. Carthage’s in the Western semi final in Fraher Field. At the end of a competitive game we emerged as winners and will now play Dungarvan in the Western Final. TEAM: S. RYAN, C. McCARTHY, J. DUGGAN, M. COLEMAN, S. AHERN, C. PRUNTY, M. TWOMEY, D. McGRATH, S. WHELAN BARRETT, N. MONTGOMERY, J. BERESFORD, S. CLIFFE, T. LOOBY, S. DALY, E. KIELY. SUBS: K. DWANE, D. LOOBY. Our Junior hurlers will play De La Salle in the County Final at 8pm this Friday night in Carrickbeg. This Sunday morning we play Kilgobnet at 12pm in Bushy Park in the Western Final. This Saturday night the Waterford County Board are staging Strictly Come Dancing in Carriganore with the event getting underway at 8pm. Our Michael Kelleher will be taking part on the night and we wish him and Helena Byrne the very best of luck on the night. Tickets for the event are still on sale and we appeal to all our members to please support the event. On behalf of all in the club we would like to send our heartiest congratulations to Mark Gorman and his bride Keeva Fennelly who were married last weekend in Ballyhale. We wish them both the very best of luck and hope they have many happy years together. Our club bingo session continues in the CBS Hall this Sunday night with a jackpot of €950. Our ever popular Jack the Joker fundraiser continues this Sunday night in Alice O’Connor’s Bar where the jackpot is €4800 as on Sunday night Willie Whelan was drawn out of the drum and chose card number 4 which when turned was not the joker but he did win €50. John Fitzgerald and John Fitzgerald won €25 each. As well as our group of ticket sellers tickets can be purchased from Village Flowers, Spar, Mousies Takeaway, Minnies Bar, Abbeyside Post Office and Crotty’s Bar. On Saturday night last we defeated Ardmore in Round 4 of the County Championship in Fraher Field. We now have to await a draw to see who we will play next. TEAM: S. ENRIGHT, D. COLLINS, B. LOOBY, C. McCARTHY, J. ELSTED, S. O'HARE, D. McGRATH, J. BERESFORD, J. O'MAHONY, S. BRIGGS, N. MONTGOMERY, C. PRUNTY, M. O'HALLORAN, M. FERNCOMBE, P. HURNEY. SUBS: S. WHELAN BARRETT, J. HURNEY, G. HURNEY, T. LOOBY. Our intermediate football team maintained our Intermediate status for 2018 thanks to a comprehensive win over Stradbally on Friday night last. TEAM: K. DWANE, G. BREEN, D. HENLEY, C. DWYER, C. McCARTHY, P. LYNCH, M. POWER, E. ENRIGHT, M. FIVES, S. WHELAN BARRETT, M. GORMAN, C. MOLONEY, T. LOOBY, J. O'BRIEN, T. MURRAY. We play St. Carthage’s in the Western semi final this Saturday at 3:30 in Fraher Field. On November 11th Waterford County Board are staging Strictly Come Dancing in Carriganore and our own Michael Kelleher will be one of those putting his best foot forward on the night. This Sunday Michael is holding a table quiz in Minnies bar at 5pm in order to raise money and we ask all our members to please support the quiz. Our club bingo session continues in the CBS Hall this Sunday night with a jackpot of €900. On behalf of all in the club we would like to send our sympathies to the family and friends of the late Barry Goode who passed away last weekend.